Emilie Shapiro lives and works in New York City, designing and creating her own jewelry line, Emilie Shapiro Contemporary Metals. She teaches wax-carving classes and specialty workshops at various studios including the 92Y, Liloveve Jewelry School, and other studios throughout the NY metro area. 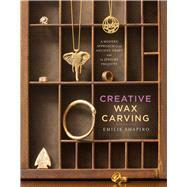 Her previous book is How to Create Your Own Jewelry Line (Sterling).